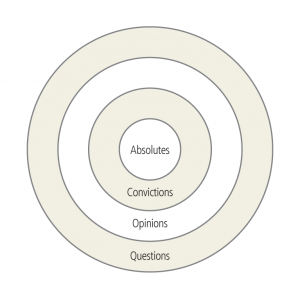 These criteria for determining the importance of particular beliefs must be considered in light of their cumulative weight regarding the doctrine being considered. For instance, just the fact that a doctrine may go against the general consensus among believers (see item 6) does not necessarily mean it is wrong, although that might add some weight to the argument against it. All the categories should be considered collectively in determining how important an issue is to the Christian faith. The ability to rightly discern the difference between core doctrines and legitimately disputable matters will keep the church from either compromising important truth or needlessly dividing over peripheral issues. Another helpful resource on this is Albert Mohler’s A Call for Theological Triage and Christian Maturity. Dr. Mohler distinguishes between first-order doctrines (a denial of which represents the eventual denial of Christianity itself), second-order doctrines (upon which Bible-believing Christians may disagree, but they create significant boundaries between believers, whether as distinct congregations or denominations), and third-order doctrines (upon which Christians may disagree, but yet remain in close fellowship, even within local congregations). These categories are my attempt to describe the relative importance of Christian beliefs, distinguishing between those beliefs essential for salvation and those essential for a healthy Christian worldview. In the book of Acts, the bare minimum that a person must know and believe to be saved was that he was a sinner and that Jesus saved him from his sin. As Paul told the Philippian jailer, “Believe in the Lord Jesus and you will be saved” (Acts 16:29-31; cf. 10:43). This is enough to counter the postmodern innovator argument that we can be saved without knowing and believing in Jesus. But any thinking convert will inquire further about this Jesus. While he may not know much more at the point of conversion than Jesus is the Lord who has saved him, he will quickly learn about Jesus’ life, death, resurrection, deity and humanity, and relation to the other two members of the Trinity. Anyone who rejects these core doctrines should fear for their soul. According to the Athanasian Creed, whoever does not believe in the Trinity and the two natures of Jesus is damned. However, since it seems possible for a child to come to faith without knowing much about the Trinity or the hypostatic union (this is likely not the place where most parents begin), I take the Creed’s warning in a more benign way—that we do not need to know and believe in the Trinity and two natures of Christ to be saved, but that anyone who knowingly rejects them cannot be saved. The final category is important doctrines which genuine Christians may unfortunately misconstrue. I think that every Christian should believe that Scripture is God’s Word, know its story of creation, fall, redemption, and consummation, and know something about the nature of God, what it means to be human, and what Jesus is doing through his church. However, many people have been genuine Christians without knowing or believing these things (though their ignorance or disbelief in these facts significantly diminished their Christian faith). 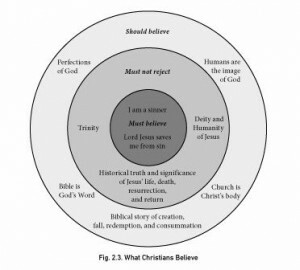 Thus, I believe that every doctrine in this diagram is crucially important for sound Christian faith. And some are so important that we cannot even be saved without them. Diagram posted with permission of Zondervan.